Could Brad Ross become the next Darcy Tucker for the Toronto Maple Leafs? That was the plan when Brian Burke drafted him 43 overall in the 2010 draft. Ross is a top prospect for the Leafs who is forecast to become a third line shift-disturbing winger. Ross was a hopeful for the Canadian World Junior team but was unsuccessful in his bid. Currently he is playing for the Portland Winter Hawks of the WHL, and in 44 games has 29 goals, 26 assists for 55 points. Ross also boasts a plus/minus of plus-2 while amassing 112 penalty minutes. At age 19, this will be Ross’s last season playing in the CHL. 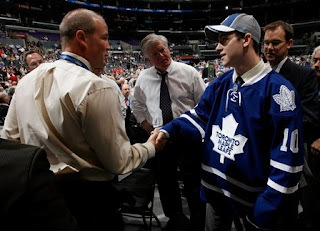 Next season Ross will make his pro debut in Toronto playing for The Leafs or the AHL affiliate the Toronto Marlies. Ross projects to be a super-pest who works hard and is difficult to play against. He will be loved by his teammates and home team fans, but vilified and loathed by the rest of the world. Ross is 6’1” and weight 183 Lbs. and will need to continue to add strength and bulk to be able to play his style of hockey against men at the pro level. Ross has been able to score at the junior level producing 69 points in the 10-11 season, and 68 points in the 09-10 with Portland. In December, Ross had a six game goal scoring streak in which he scored eight goals. It will remain to be seen of course if Ross will be able to produce offensively at the next level. There may be a perfect window of opportunity for Ross to assert himself onto the Leafs roster as Colby Armstrong’s current contract will expire at the conclusion of the 2012-2013 season. Should Armstrong not be re-signed it would allow Ross to assume the third line left wing position. Given Armstrong’s injury history, it is reasonable to assume Ross may be given an opportunity to crack the NHL next year. Ross impressed at last summer’s rookie tournament with Toronto, “He’s got some good hands and he’s a very competitive person,” said Dallas Eakins, the coach of the Marlies. “I saw some of that at his game. He is obviously going to have to get stronger faster and with a little more endurance so he can do that every shift.” Eakins told the Toronto Star. Ross continues to climb up the Leafs prospect depth chart and is beginning to look like a sure-fire NHL player in the near future. Ross will quickly be adopted as a fan favorite in Toronto, while the rest of the league will love to hate him. Posted by pharling at 12:59 p.m. Anonymous January 18, 2012 at 9:35 p.m. It will be his last season in the WHL, only if the Maple Leafs decide to send him to the AHL. Otherwise, he'll be back in Portland. jaylen watkins January 19, 2012 at 1:55 a.m.
Lovely post made. I am impressed with action.